Love at a garage sale? Oh yes. And a whole more. So if you missed it, Kristen Rajczak offers a recap of "The Office." How long has Michael Scott been looking for love? Over the course of seven seasons, he has tried and failed to find his happily ever after with several women: Jan, Carol, the waitress from Benihana, Pam's mom, Donna and, of course, Holly. From the moment she started mimicking his awkward character voices, we knew they were destined to be together. 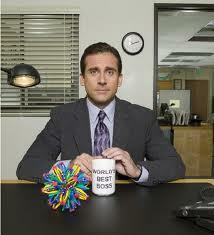 And with Steve Carrell's imminent departure from the show, it's the only way Michael's story could end. In Thursday's episode, "Garage Sale," the Dunder Mifflin employees held a garage sale in the warehouse. While Dwight begins trading with his co-workers to get the best item there and Andy, Darryl, and Kevin play "Dallas" the board game, Michael and Holly try to sell some of their stuff to get ready to move in together. Everything seems to be on the right track for them—except when Holly tells Michael he might want to keep a beer sign from his bachelor pad, "just in case." Cut to Michael calling Holly's father to ask permission to propose—Michael doesn't believe in "just in case." But maybe he should as Holly realizes her father isn't doing so well. He doesn't remember that she lives in Pennsylvania and won't talk to her about Michael's phone call. He can't focus on it. Holly decides she needs to move back to Colorado to be with him as he ages. She asks Michael to go with her. It's impossible, really, for a successful TV comedy to realistically say goodbye to its main character. And yet, here the writers of "The Office" have found a way for Michael to leave that's not just consistent with his character—because of course Michael would only leave his work family for love—but is also consistent with issues of people his age. The slight bit of silver showing in Michael's hair last night shows that while "The Office" still feels fresh, particularly this season, he isn't getting younger. Many middle-aged professionals have to give up a lot to care for aging parents. Holly and Michael, weird though they may be, show their true goodness in deciding that's a worthy reason to leave Scranton. For a second, it seemed like Holly misinterpreted Michael saying no to her proposal to go to Colorado. We knew he had been planning a proposal all episode—including a humongous ring that he said he paid for with "three-year's salary"—and he didn't want their special moment to happen in the break room. Did anyone else get chills watching Michael lead Holly around the office? He took her through their courtship, from the moment Toby said he was going to Costa Rica to the first time they kissed in the stairwell. But he wasn't just taking her on a romantic trip down memory lane. Michael was reminding us, the loyal viewers, of how far he has come in seven seasons. He's botched proposals and misread love affairs before, yet hear he is, sure Holly will say yes but wanting her to have a magical moment anyway. He almost rushed it, don't get me wrong, but Pam stopped him from writing the proposal in gasoline and burning it into the parking lot. Oscar, Ryan, Jim, and Pam then helped him devise a better plan. Yes, how far they have all come. … and the sprinklers go off. Holly says yes, and really, it's pretty perfect. But, Michael then proclaims that he's leaving the office, moving to Colorado with Holly. "The Office" will never be the same. Without Michael Scott at the helm, how will things run smoothly at Dunder Mifflin? Or, maybe, for the first time ever, they will. But that just won't be as fun to watch.